Teleportation complete. All that remains now is a dose of melodrama to heighten the tension and the two can throw fireworks/hit each other with bo staffs. 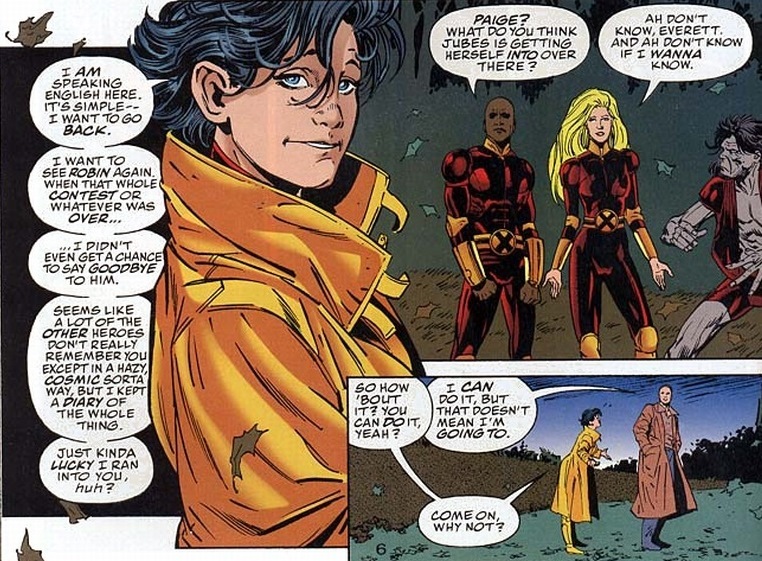 I’d like you to always have in the back of your mind that in current comics, Jubilee is a mother. Also, a vampire. The past couple of years have been rough to her. Of the eleven matches in this series, six were determined by writers and five were determined by voters. This one did not get left up to the fans, but we can all pretty much guess our eventual victor. 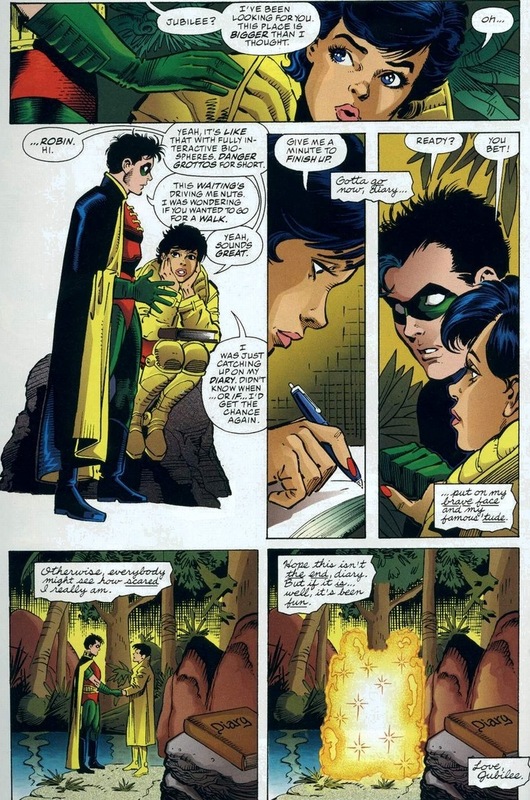 Whether it’s a constant overcompensation by the writers for no superpowers or simply the benefit of an incredible amount of training, Robin totally takes down the living Fourth of July. I don’t normally like to spoil this stuff, but I can’t see this coming as any sort of shock whatsoever. For the other fights, you can buy the book. I won’t spoil those. 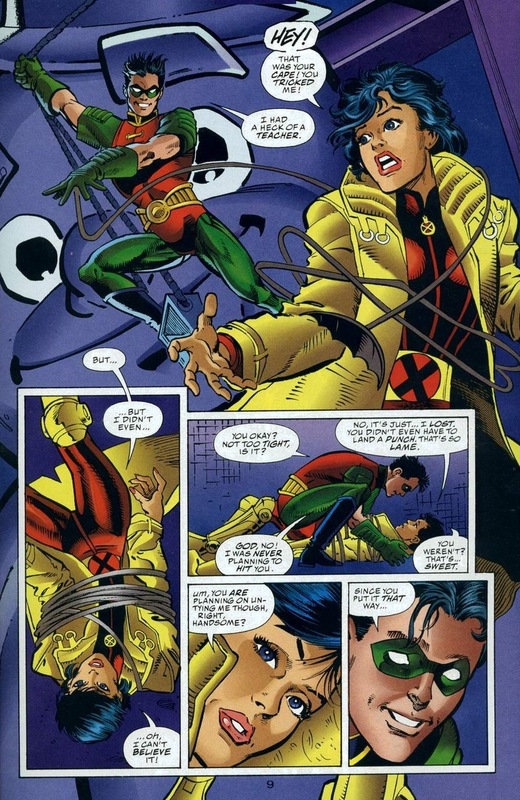 While Robin takes some time to learn about Jubilee’s fetishes, I can’t stress enough just how insane this crossover event becomes. It’s great. 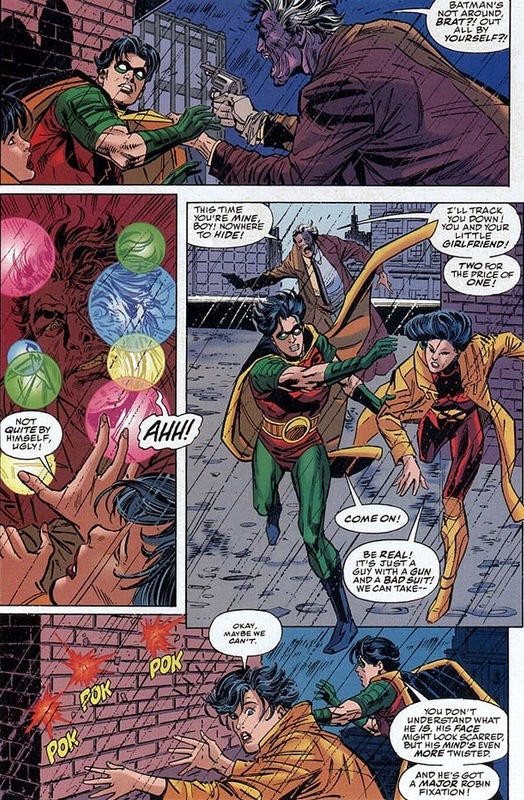 Situations that have never occurred in comics and never will again pop up on every other page. 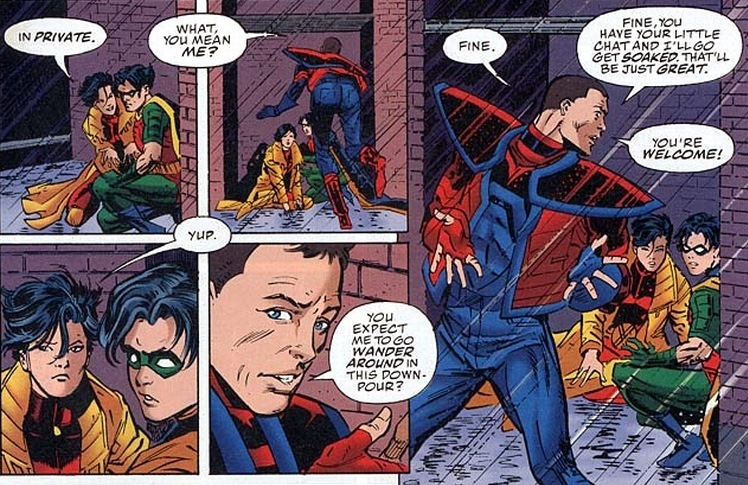 Want to see Peter Parker flirt with Lois Lane? I’m about to show you. 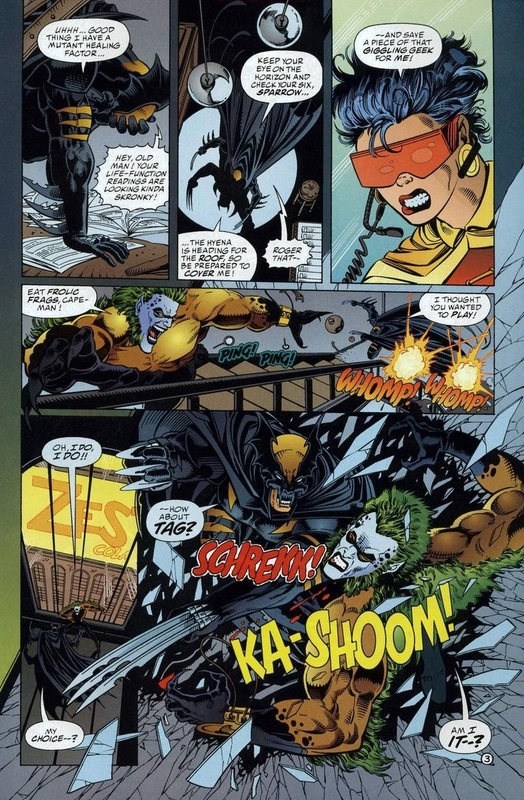 How about Dark Claw (Batman merged with Wolverine) fighting Hyena (Joker merged with Sabretooth)? Yes, it’s amazing. By the way, those Amalgram combo-superhero issues? They made 24 of them. 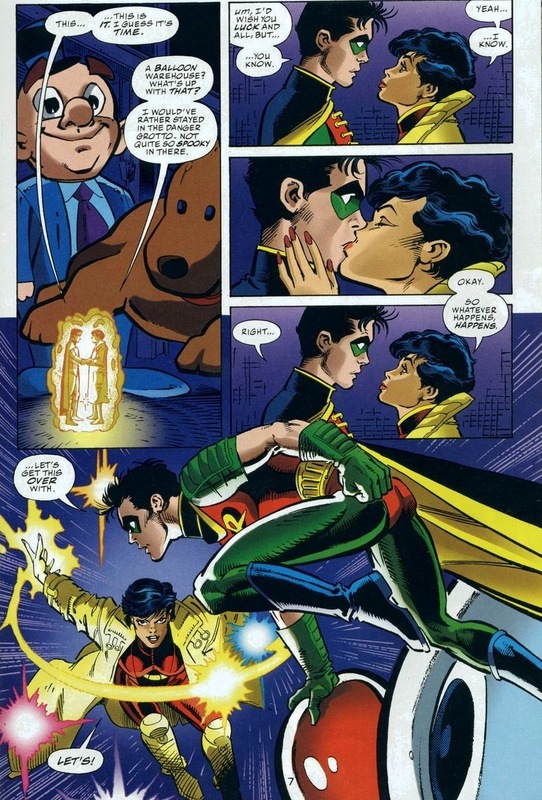 The ’90s could be a wacky time for comics. But as we jump back to our sorta-love story, we pick up a year later in the sequel. 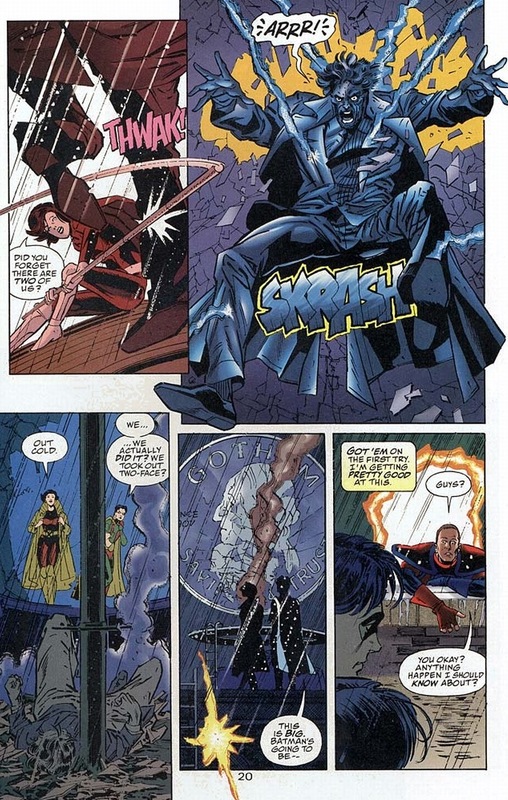 The superhero Access (real name Axel Asher) has the superpower to travel between DC and Marvel. That’s his sole purpose for existing, and Jubilee wants to abuse that power. 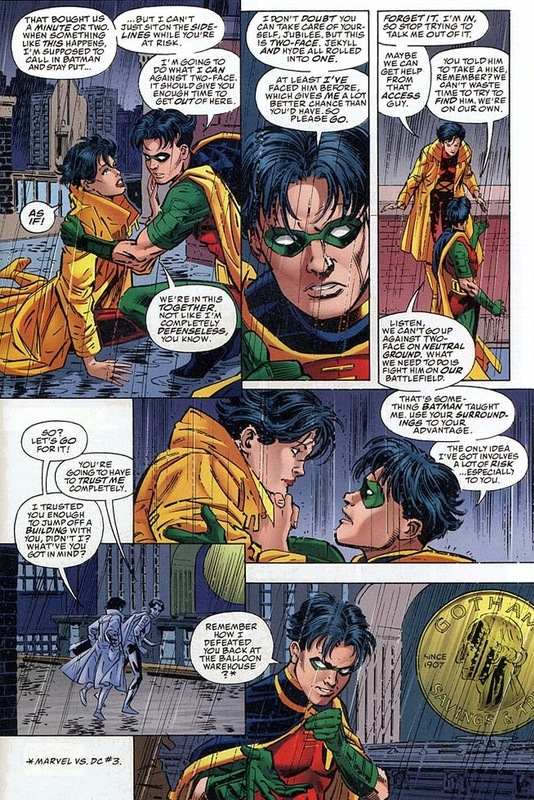 Remember what happens when two superheroes attempt a serious talk? That emotional bubble must be popped before it manifests itself into something mushy and gross. 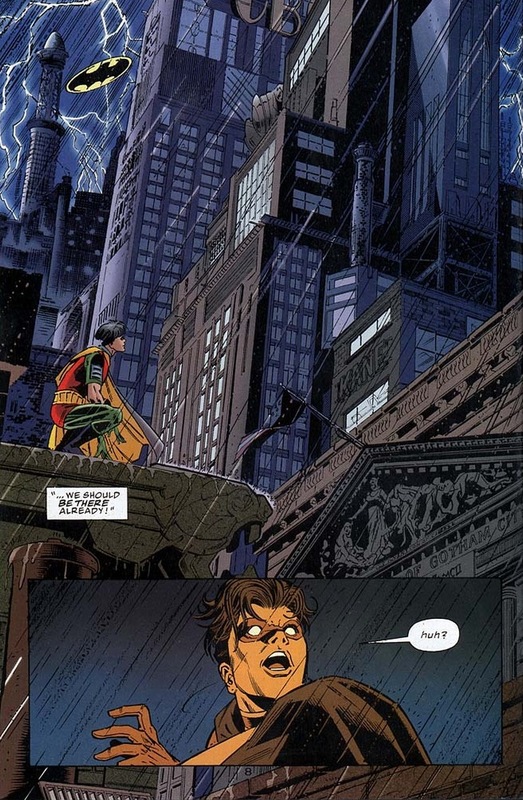 Luckily, before Robin and Jubilee can round the bases in the rain, they have to first overcome an obstacle. It comes with the cape and cowl duties. 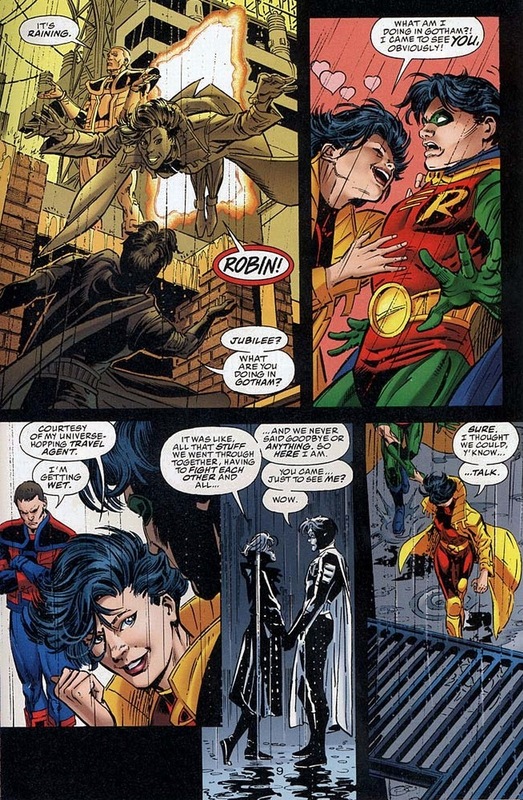 In this series, Robin’s petrified of Two-Face. Like Harvey Dent’s the Darkseid of Gotham City. 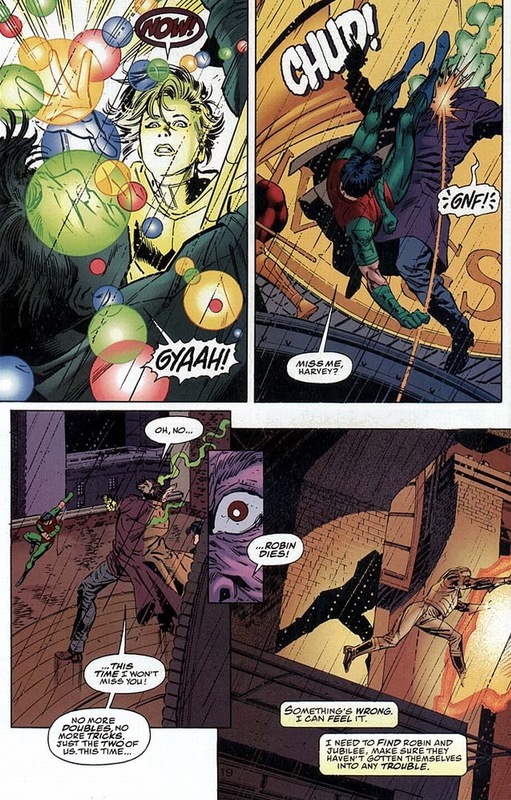 I understand that Two-Face’s a good shot and such, but so is 90% of the bad guys Robin battles every night he goes on patrol. 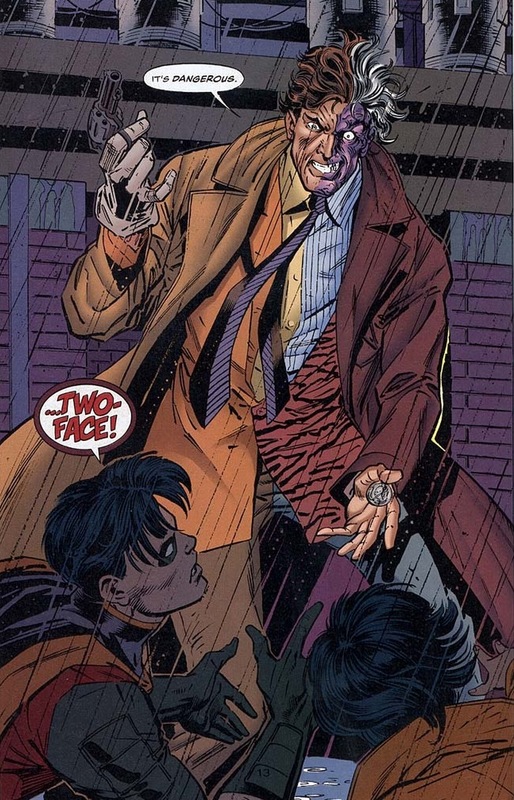 For the sake of this story, Two-Face is someone to be feared. 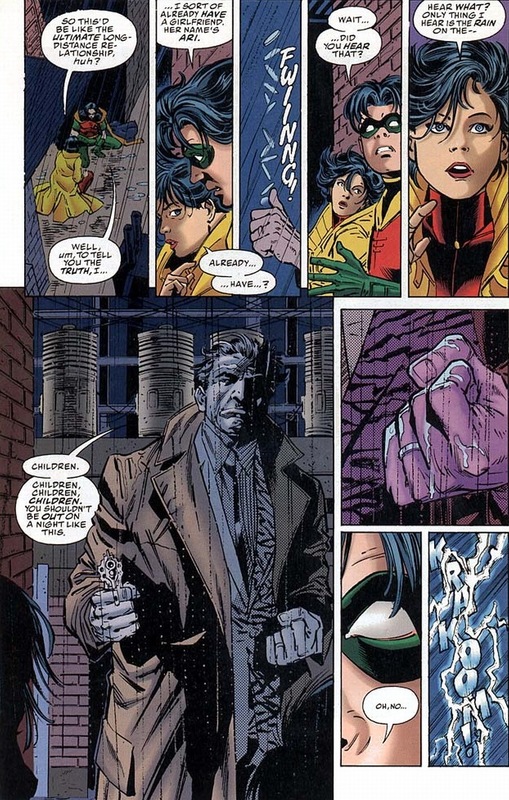 Robin’s blood freezes as a grown man wanders the soaked streets looking for children to shoot. Plot-wise, what’s about to happen works — the goal to heighten suspense and give the two young superheroes a legitimate challenge is totally achieved. But just how dangerous is Two-Face really? 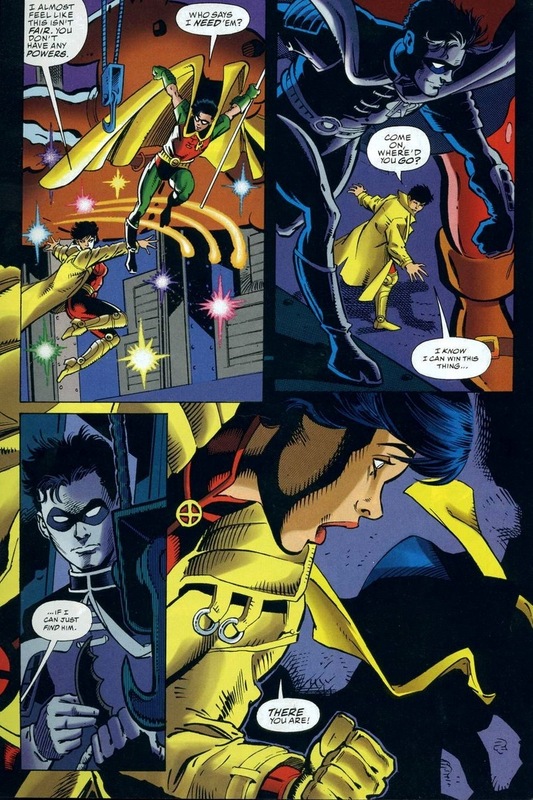 Couldn’t Jubilee light a Roman candle under his chin followed with Robin’s kick to the face? Down goes the supervillain. How do these kids beat this unstoppable maniac? Capes, of course, which blows The Incredibles‘ moral right out of the water. Also, note that giant coin? Symbolism, dude. You know how earlier I mentioned it would take one firework and a good kick to defeat Two-Face. I’m wrong and I apologize. It took one firework and two kicks. I’m a big man and I can admit my mistakes. 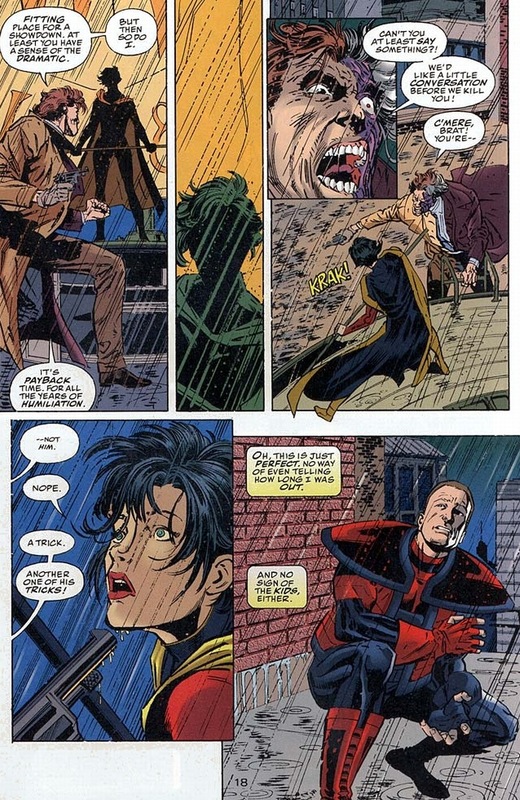 Scorpion (Spider-Man’s baddie) pops up in the next page. He’s a much scarier supervillain in terms of abilities, but I’m going to skip the fight. 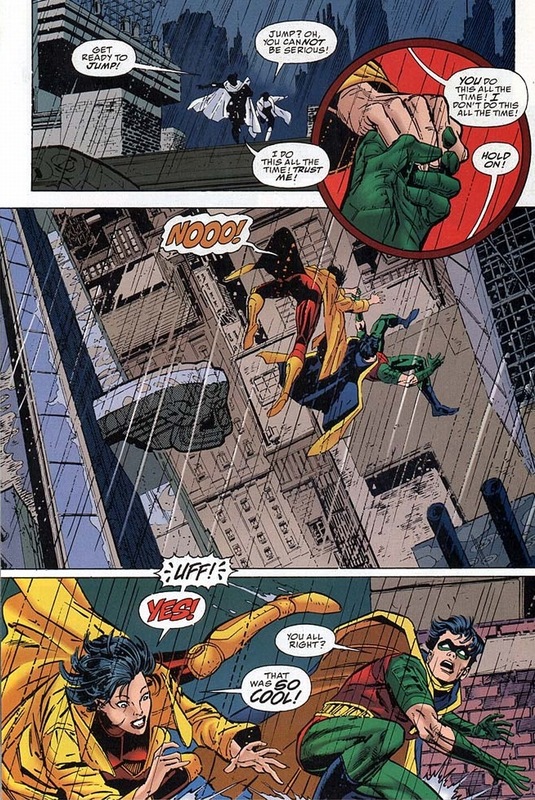 In summary, Batman pops up to shows Scorpion why he’s the C-lister he is. 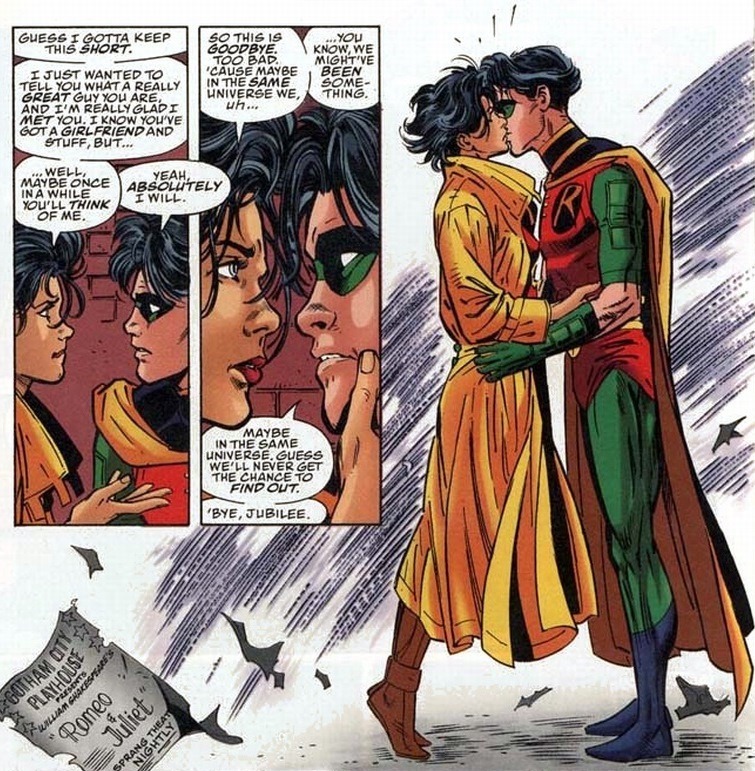 If you look again, Robin’s the one leaning in. He totally kissed her. Good for him. And to be fair, it’s probably not cheating if the girl lives in another universe. 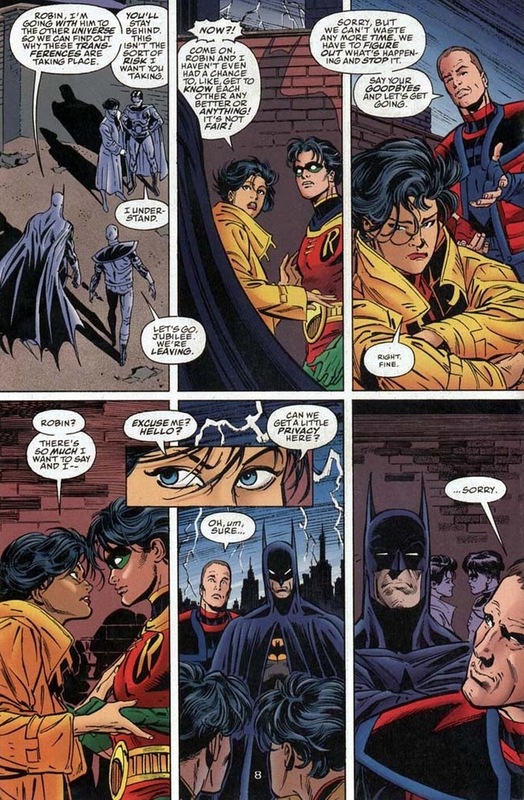 Jubilee was basically Robin with a vag. 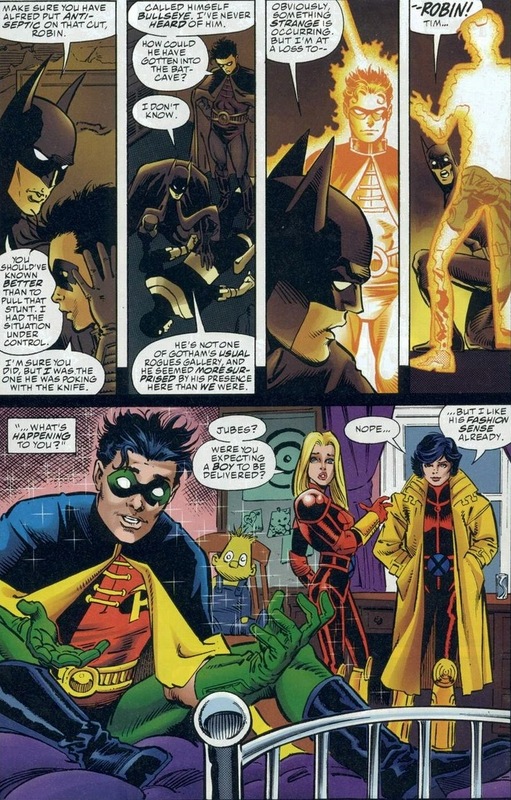 Both were sidekicks to brooding, dark heroes (He with Batman, her with Wolverine), and the outfit she wore for the longest time was a copy of the classic Robin look – red top, green shorts, tiny boots, and a yellow overcoat in lieu of a yellow cape. She kept that same look in the X-Men cartoon, except they changed the top to hot pink and the shorts to teal.